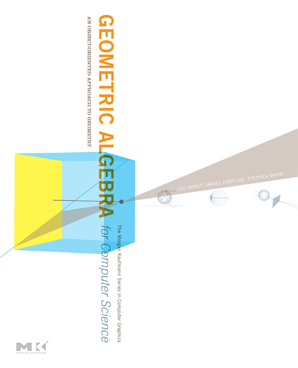 This page contains Matlab software and a tutorial for learning Geometric Algebra. This tutorial is aimed at the sophomore college level, although it may provide a gentle introduction to anyone interested in the topic. GABLE was a prototype geometric algebra system. The prototype was successful, but we have moved on to C++ and Java libraries for geometric algebra. However, feel free to download the Matlab software and tutorial; if you encounter any problems or have any comments, please email them to us: L.Dorst@uva.nl and/or smann@uwaterloo.ca. although be aware that we no longer support GABLE. If you are serious about studying geometric algebra, you should should look at our book, which discusses geometric algebra in more depth, as well as having a stand alone multi-platform viewer, tutorials, and C++/Java library generator. Background information on the creation of GABLE: The Making of a Geometric Algebra Package in Matlab, Technical Report.